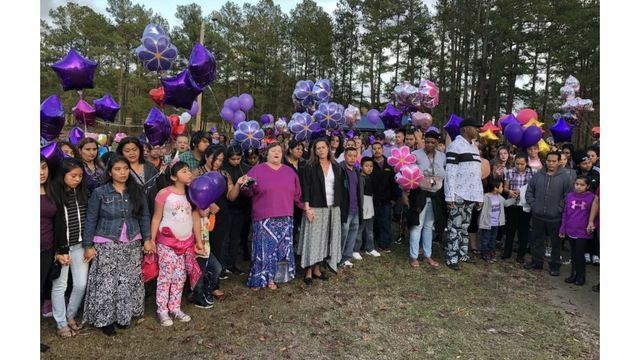 LUMBERTON, N.C. (WNCN) - Hundreds turned out for the funeral of a slain teen Lumberton girl just hours after the arrest in her killing was announced by the FBI Saturday. Hania Aguilar, 13, was taken by a man the morning of Nov. 5 as she was just outside her Lumberton home. About three weeks later she was found dead. Early Saturday, the FBI announced Michael Ray McLellan, 34, was facing 10 charges, including kidnapping and murder in Aguilar's case. On Saturday, a crowd of 900 to 1,000 stood as Hania Aguilar's mother, Celsa Hernandez, spoke about her loss, as well as her gratitude to the community during this tragic time -- which has now spanned more than a month. During the funeral at Lumberton Senior High School, many people wore purple, which was Aguilar's favorite color. The funeral service program was titled "Remembering Hania: Honoring the Lessons that God is teaching us through her." The program had photos of Agular playing the violin, her dog 'Pedro' and one of her smiling. “We are not here to say ‘Goodbye’ to Hania. We are here to say ‘Until later'," one speaker said at the funeral.